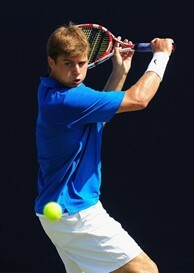 Ryan Harrison advanced to the Atlanta semifinals in 2011. ATLANTA (AP) -- Organizers had good reason to worry that the field for the Atlanta Open would suffer if top players took this week off to prepare for the Olympics. Instead, Atlanta attracted all four Americans who will play singles in London: Ryan Harrison, John Isner, Andy Roddick and Donald Young. Roddick and Isner also will play doubles at the London Games. Isner, the top seed, won last week's ATP tournament in Newport, R.I. It's the best-case scenario for the Atlanta tournament in its first year in a new midtown location. "For a tournament in the U.S. with this timing, we're absolutely loaded and tickled to death with that,'' tournament director Bob Bryant said Monday. Young was the first of the four Olympians to lose. Steve Johnson, who won two straight NCAA singles championships at Southern California, beat Young 6-3, 3-6, 6-3 on Monday night. Roddick, the No. 4 seed, said the Olympics haven't changed his approach this week. Roddick said he briefly considered taking a week off. Roddick and other top seeds had a bye in Monday's opening of the main draw. Jack Sock, 19, of Lincoln, Neb., upset Alex Bogomolov Jr., the No. 7 seed, 6-2, 4-6, 6-4 in the first match to be completed following an afternoon rain delay. "I love my job, I love what I'm doing,'' Harrison said. "As long as I'm feeling good, there's no reason for me to take off. Bryant said the new location and attractive field combined to boost tickets sales 30 percent from last year. Two-time defending champion Mardy Fish and Brian Baker, who advanced to the round of 16 at Wimbledon, also are in the main draw. Fish, the No. 2 seed, beat Isner in the last two Atlanta finals. The doubles team of Bob and Mike Bryan are the only members of the U.S. men's Olympic team who are not competing in Atlanta. There also are London-bound Olympians from other nations in the Atlanta field. Kei Nishikori, the No. 3 seed, and Go Soeda will represent Japan in the Olympics. Other Olympians in the field include: Dmitry Tursunov, Russia; Lukas Lacko, Slovenia; Yen-Hsun Lu, Taiwan; and Gilles Muller, Luxembourg. Muller defeated Marinko Matosevic of Australia, 7-6 (5), 6-4. Also Monday, No. 5 seed Kevin Anderson of South Africa defeated Italy's Paolo Lorenzi, 6-4, 6-3.